OSHKOSH, Wis. - February marks the most wonderful time of the year for sturgeon spearers as Wisconsin's season opens Feb. 9 on the Lake Winnebago system. The Winnebago System is home to one of the world's largest self-sustaining populations of lake sturgeon, with an estimated 19,500 adult females and 24,500 adult males, and a unique spearing season dating back more than 85 years. "In 2019, spearers will have another great opportunity to renew traditions and go after some really big fish," says Ryan Koenigs, Wisconsin Department of Natural Resources sturgeon biologist. Forty-three fish exceeding 100 pounds were harvested in 2018, including a 75.6-inch, 155.6-pound fish harvested by Benjamin Berger and a 84.5-inch, 143.7-pound fish taken by Kyle Jenkins. "As always, water clarity and ice conditions determine spearer success -- mild weather in December and January have delayed ice formation and thus DNR staff have not collected water quality data," said Koenigs. "Anecdotal reports from locals indicate poor water clarity with reports of 5-9 feet of visibility being common. Water clarity on Lake Winnebago averaged 6.5 feet during the 2018 spearing season with a total harvest of 654 fish. Given current conditions, a similar harvest is anticipated at this time." 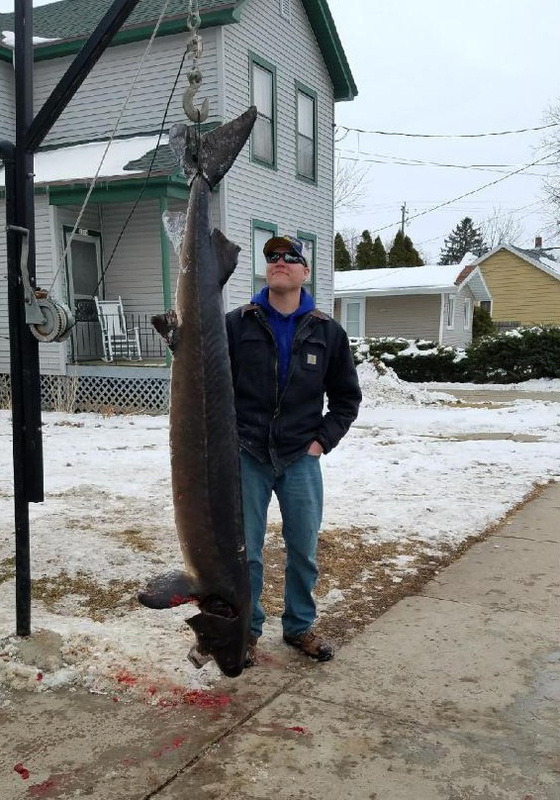 Interest in sturgeon spearing continues to be strong: 12,897 licenses (12,411 for Lake Winnebago and 486 for the Upriver Lakes) were sold for the 2019 season. Resident licenses were sold to spearers in 70 out of 72 Wisconsin counties and non-resident licenses represent33 states. "What we do know is that spearers continually tell us that it's the chance to get together with family and friends, to relive old memories and create new ones that keeps them coming back year after year," said Koenigs. The success of the Winnebago fishery and the fish population is a testament to the successful co-management of the sturgeon resource among DNR staff, public stakeholder groups, and a passionate general public. "These are really the good old days when it comes to sturgeon spearing on the Winnebago System," Koenigs says. "There are more fish in the system now than there have been for decades and more big fish than we have had at least since the early 1900s. In fact, 22.7 percent of the female sturgeon handled during 2018 spawning stock assessments were larger than 70 inches." 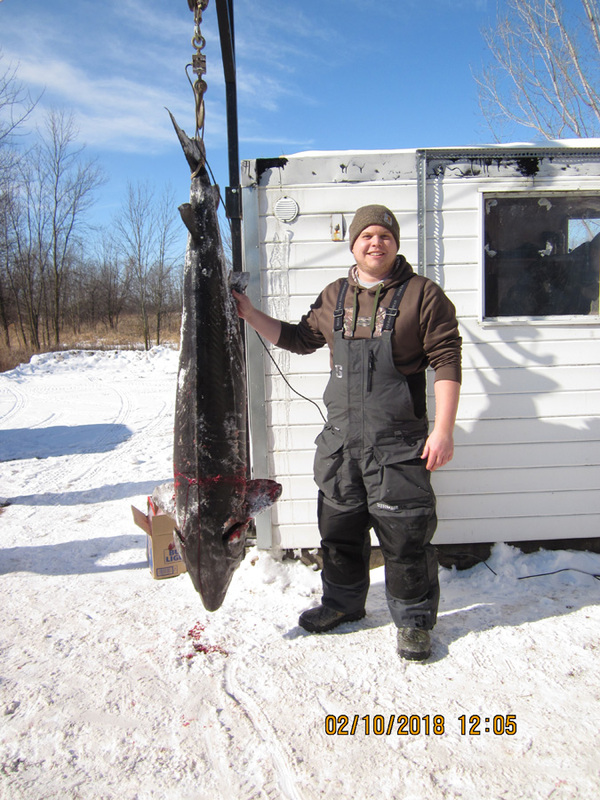 Sturgeon spearing opens at 7 a.m. Saturday, Feb. 9 and may run for up to 16 days (through Feb. 24). However, an early closure may be triggered if pre-set harvest caps are reached. If early closure occurs, notices will be posted and the sturgeon spearing webpage will be updated at dnr.wi.gov, keyword "sturgeon." A helpful sturgeon spearing email list is also available to provide instant email notifications. The system-wide harvest caps remain unchanged from 2018: 430 juvenile females, 950 adult females and 1,200 males. To spear sturgeon, participants must possess a sturgeon spearing license and tag. Spearing hours run from 7 a.m. to 1 p.m. and all sturgeon must be presented at a DNR operated registration station by 2 p.m. of the same day the fish is harvested. Successful spearers must immediately validate their carcass tag by removing the validation stub - a validated carcass tag does not need to be attached to a harvested fish before registration, as long as the spearer stays with the fish until registration. However, the harvest tag must be attached to the sturgeon if the spearer leaves the fish prior to registration. DNR staff recommend that spearers bring a clear plastic zip-top bag and tie to protect and secure the paper tag to the fish. More details about sturgeon spearing throughout the Lake Winnebago system, including the complete 2019 rules and a list of the 10 registration station locations, can be found at keywords "Winnebago system sturgeon." To learn more about sturgeon management in Wisconsin, be sure to check out an episode of the Wild Wisconsin: Off the Record podcast featuring Ryan Koenigs. Podcasts are available on YouTube, iTunes, Stitcher and PodBean. Good air quality for Wisconsin on Sunday, April 21, 2019 at 2:01 pm CT.